The Killer Tour program 1971-1972 (version one). 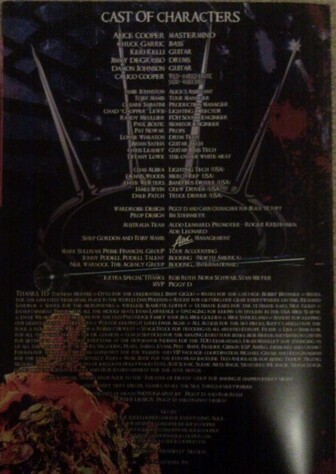 This is the front and rear of the Killer Tour program produced for the Killer Tour. It is quite possible that this programme was used on the later dates on the Love it to Death tour. 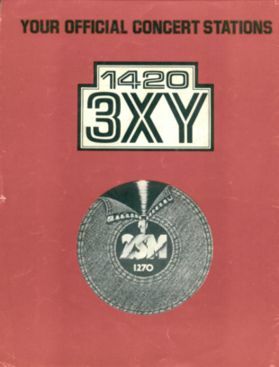 This version was released in very few numbers and was later replaced by the well know Killer program which has the flexi disc on the rear cover. It has twenty pages including the front and rear covers and produced in colour and black and white. From the scan further below you can see the contents. It is a great program with individual page shots of Alice, Glen, Michael, Neal and Dennis. No date or printing details are given. The Killer Tour program (second version). 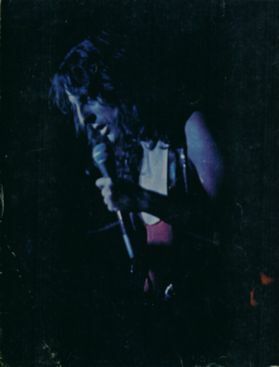 The second version of the Killer tour program was exactly the same as the first version above except that the rear covers differed as can be seen in the scans (below left). 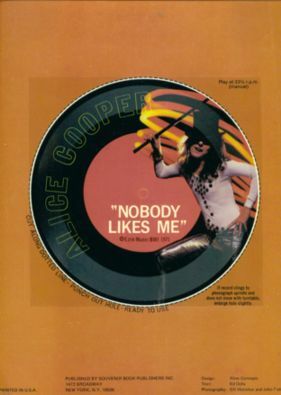 The rear cover of the second version contained the cut out flexi disc which had the studio version of the song "Nobody Likes Me". This is the more common version of Killer Tour program as it was produced in larger numbers. 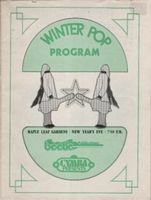 This version of program provides no dates but was printed in the USA. The Killer Tour program (version three). 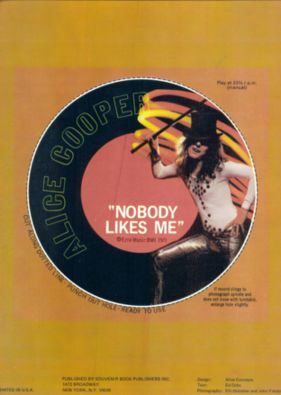 To the right below is the third version of the program published that appears the same as the second version but because of the high costs involved in pressing the "Nobody Likes Me" single the last runs were pressed without the grooves giving only the impression of a free record. (Source Antony Jones) You can clearly see no grooves or the spindle cut out hole. The inside pages are the same as the first and second versions of the program. This version of program also provides no dates but was printed in the USA. 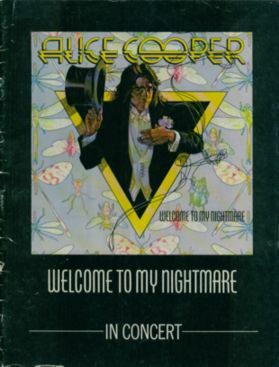 Although it was not completely designed as a tour program, this booklet was produced by Alice Cooper for the Alice Cooper Show, "it's a promo 'play bill' that was given to the press for the tour." (Source Brian "Renfield" Nelson). 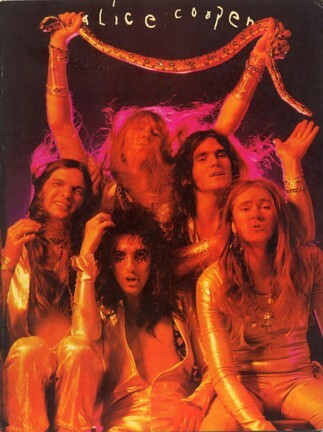 It was also used as part of the Billion Dollar Babies Press Kit for the album (Source Antony Jones). This booklet credits the touring personnel, has a small article by Ashely Pandel of AC promotions, and an article about the session work for the Billion Dollar Babies album. It also contains some good individual photographs of Alice, Glen, Michael, Neal and Dennis. ( US / Canada - 4th April - 16th July 1975, 13th - 20th December 1975. European - 31st August - 8th September 1975, 16th - 20th September 1975. Neither version has dates but both were printed in the USA. The 1977 Australian and New Zealand Welcome To My Nightmare Tour program. This tour program has a similar cover and some similar pictures inside to the US version but is smaller in content. 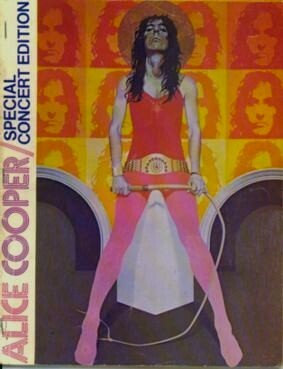 It is unique for an Alice Cooper tour program as it was produced especially for the Australian and New Zealand Tour of 1977, no other tours had their own tour program. This program does not credit any performers on the tour. 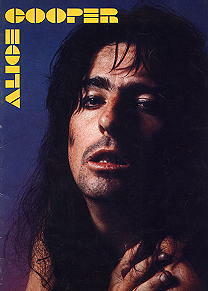 In addition to the pictures there is an advertisement for the Alice Cooper collection to 1977 and also contains several other advertisements for local companies. There are no dates or printing details. 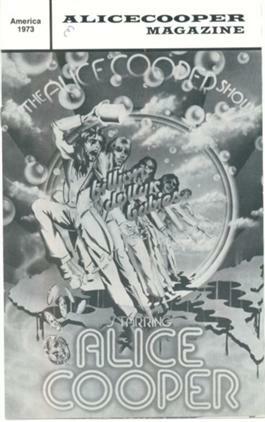 There were two different versions of tour programs produced for the Madhouse Rock Tour of 1978 tour. The first program has many similarities to the Guilty tour program having similar pictures. Some of pictures have been resized. Also the credits page layout is similar but the credits show different performers. The latter more common Madhouse Rock tour program (on the right) is in full colour and has a different pictures from the earlier version. No date displayed in either programs. The first version was printed in the USA. (US / Canada - 20th June - 28th November 1981. European - 26th January- 9th February 1982, 27th Februrary 1982. The tour programs for the Flush the Fashion US Tour of 1980 and the Special Forces Tour of 1981-82. These programs were printed in both the US and UK, they are however essentially the same with the only changes being made to the credits page. The only other minor change is that the US produced program has stiffer card covers whilst the UK produced has the covers made from the same paper as the inside pages. The program is large in size, all colour and has many pictures of Alice from this period of change, a real Flush of the Fashion. (US / Canada - 24th October - 19th November 1986 and 12th December 1986 - 31st March 1987. 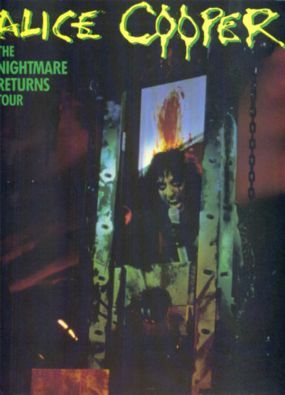 The 1986 Nightmare Returns Tour Program US version. 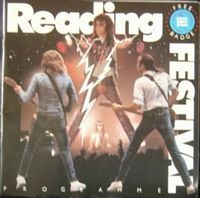 The same tour program was also used on the UK portion of the tour. 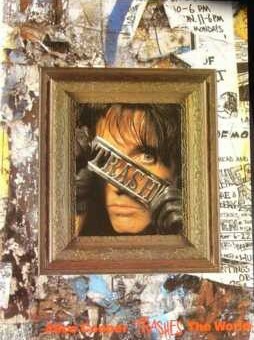 Contains several great pictures from the Alice Cooper group days, a lengthy article about Alice, Lp adverts and tour credits. 24 pages including the front and rear covers. A well produced tour program. All colour production. This program has a date of 1986 and was printed in the USA. Front and rear cover scans below. 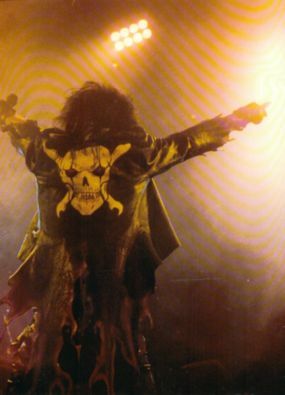 1987 saw Alice tour again with The Live in The Flesh / The Raise Your Fist and Yell Tour. This program was produced in both the US and the UK. They have the same pictures but differ in the credits section due to the changes of tour performers and crew. There are plenty of pictures to supplement an article about Alice and also an article about Kane Roberts. Included also is Alice's required video viewing, adverts for Alice's Raise Your Fist and Yell LP, Kane Robert's solo Lp and the tour credits all within 24 pages. All colour production. Both the US and UK versions of the programs are dated 1987 but were printed in their respective countries. (US / Canada - 31st October 1989, 28th December 1989 - 9th April 1990. European - 21st - 22nd November, 25th November - 2nd December 1989, 16th - 23rd December 1989, 1st - 22nd July 1990. (US /Canada - 22nd October 1987 - 29th February 1988. 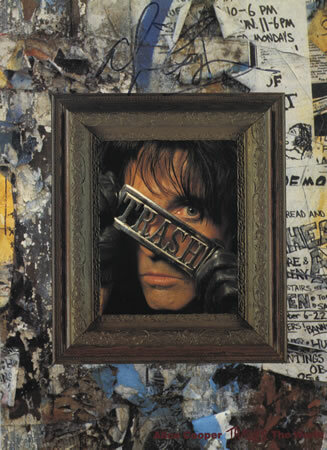 1989 saw the successful Trash album released and Alice toured the world on the Alice Cooper Trashes the World tour. These two programs are from the US and UK legs of the tours. Once again performers and crew changes are credited differently with these programs. There are 24 pages (including the front and rear covers) with plenty of pictures of Alice and a several pages of notes about Alice. 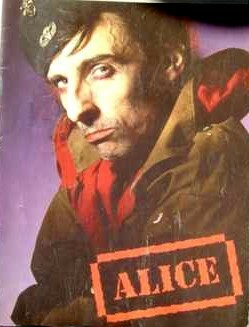 All colour and large format production, plenty of great pictures of Alice. 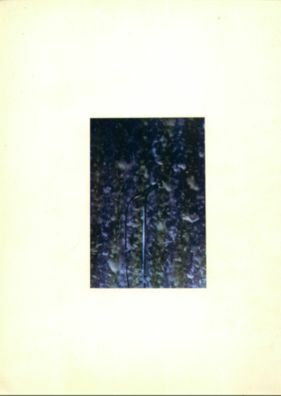 Tour program dated 1991 and printed in England. (UK - 28th September - 10th October 1991. 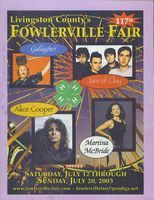 The Dragontown and Barebones tours both used this 2002 tour program. Most of these programs were purchased pre signed signed by Alice. An all colour production, light on words with a one page message from Alice and the tour credits. The photos are from Alice's The Nightmare Returns, Live in the Flesh, Trash and Dragontown tours. (Source Matt Coddington) The program is dated 2002 and printed in the USA. European - 5th - 14th November 2002. UK - 16th - 26th November 2002. European - 28th - November - 14th December 2002. 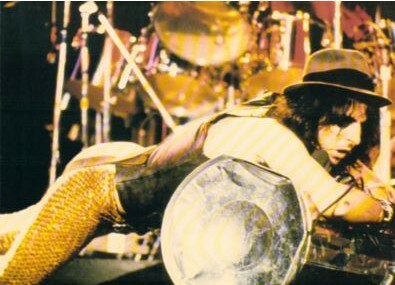 There are many other concert programs that were produced where Alice Cooper performed with other artists at events or venues such as The Fillmore East concert of 1971, The Rainbow Theatre concert of 1971 and The Reading Festival of 1987. 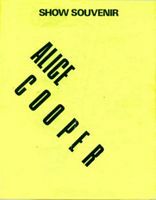 Some of these concerts were staged during Alice Coopers' official tours such as The Fillmore East concert being part of the Love It To Death Tour of 1971. For further information about these concert programs make sure you click on the link below or on the pictures of the programs below to go to Alice Cooper Concert Programs. 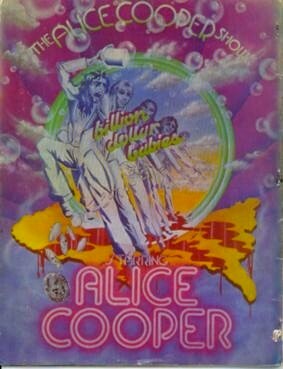 All of the images are photographs of my personal collection of Alice Cooper tour programs or otherwise credited to the source. 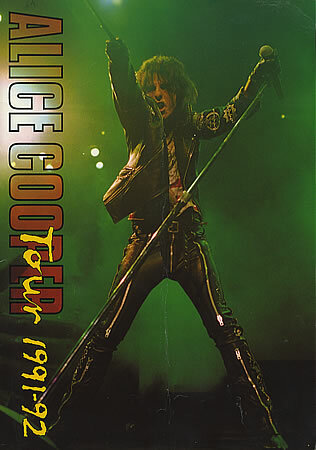 The purpose of this work is to provide information to Alice Cooper fans interested in collecting Alice Cooper tour programs. No profit or gain is made from this website and if the original owners of the tour program photographs are offended I will remove them. NB. There are 3 different versions of this program produced. The title on the cover is different with one having longer more pronounced red title whilst the other has a more compact burgundy title. There are other layout changes such as the sizing of some of the pictures, text colour and minor changes within the text as there was a drummer change (Jonathon Mover/Eric Singer) which is also reflected in the musicians' individual pictures. The burgundy titled program has Jonathon Mover as the drummer whilst both the red titled programs have either Eric Singer or Johnathon Mover. All three tour programs dated 1989 and all were printed in the UK. Click on the link below for notable differences between the three tour programs. 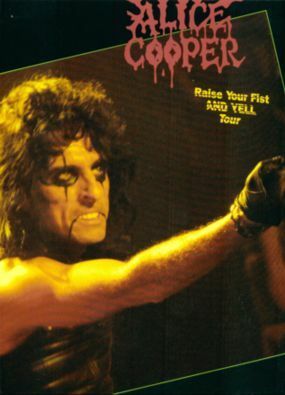 The concert programs below were also produced as a part of the Love it to Death and Killer Tours to promote Alice Cooper's appearance at a festival or as individual concert programs whilst Alice Cooper were on their major tour. 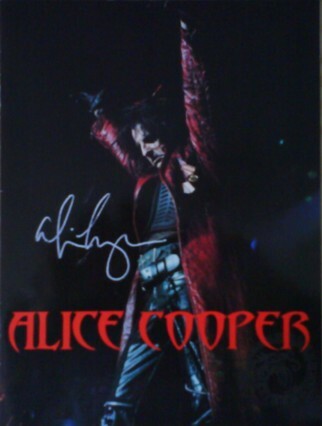 Go to Alice Cooper Concert Programs for further information about these programs. Please email me if you would like me to add your website to this page. 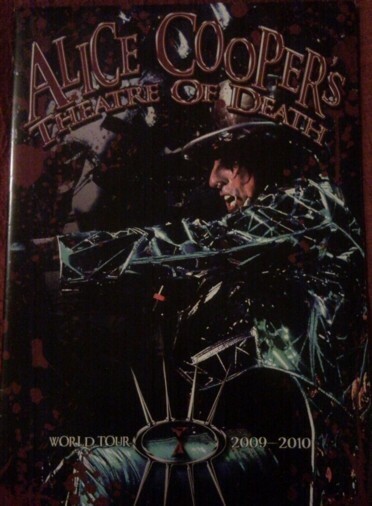 This was the last tour program produced by Alice Cooper until The Theatre of Death World Tour 2009 - 2010. 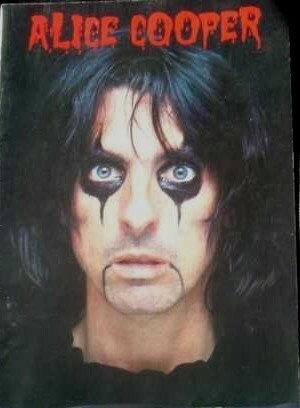 Alice's Eyes of Alice Cooper tour in Australia and the Dirty Diamonds tour of Europe / US (2005) and Alice's Psycho Drama Tours 2007/9. have not had any supporting tour programs. 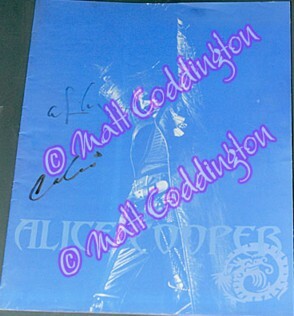 The exception to this was the Guilfest 2003 programme which is featured on Alice Cooper Tour Programs Part 2: Other Alice Cooper related Tour / Concert programs see below for a link. As mentioned the Theatre of Death tour program is the only program to be produced since the Dragontown tour program back in 2002. This time though the program is not in a book format as such but a "postergram". When full opened it becomes a large poster of Alice. The postergram is, as an excited Alice claimed after meeting him at The Thebarton Theatre in Adelaide South Australia, "a new way to do it, Rob Roth did a great job he said, He asked me personally what I thought. "Great of course!" This postergram is very informative as the reverse side of the poster has, An introduction to the Theatre of Death by your host Alice Cooper, the Set List, the Cast of Characters and information about the Guillotine and gallows. It is an all colour production with up to date pictures from the Theatre of Death early concerts.